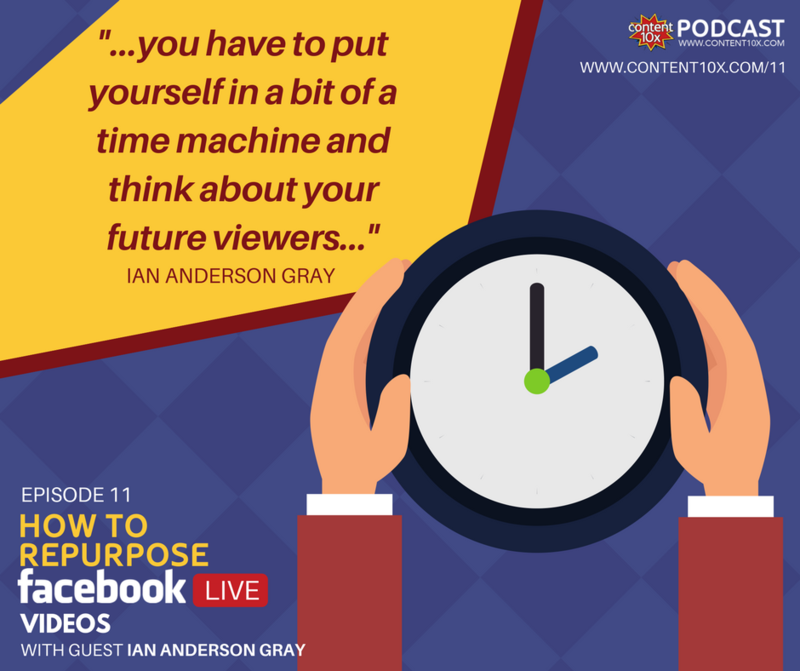 This week’s podcast episode is all about how you can repurpose Facebook Live videos and I have the pleasure of introducing you to a fantastic guest - Ian Anderson Gray. 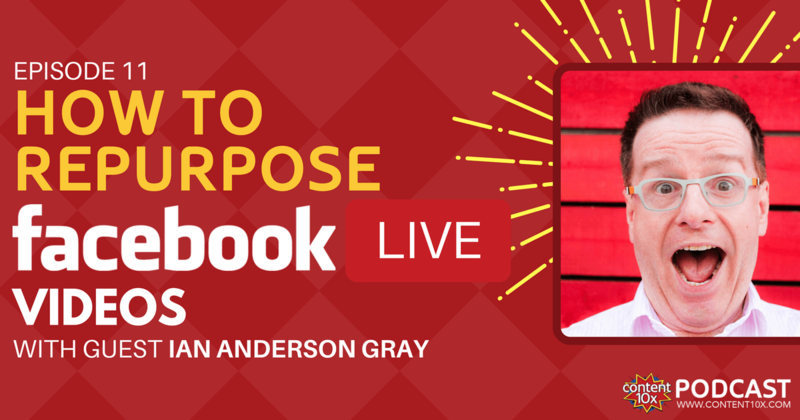 Ian is a live video marketing confidence coach and founder of Seriously Social. He’s an international speaker, trainer, teacher, web developer and consultant. He has a passion for making the techno-babble of live video marketing & social media easy to understand and helping people overcome their fear of the camera. As well as being a geek, husband, and dad to two kids, Ian is also a professional singer. Ian is a good friend, he lives near me in Manchester in the UK…although we seem to spend more time hanging out at conferences in far away (and more exotic places) like San Diego. When it comes to repurposing content, I think live video is a great starting point. I’ve already covered this topic in this post and episode 7 of the podcast but I felt it was time to bring in an expert for a much more detailed look at live video. There was no-one else that I considered talking to about this topic other than Ian! Here's a summary of what we discussed. Whilst a big part of the fun with live video is the spontaneity, it’s always a good idea to have a plan before you go live. Here are Ian’s top tips! Get your energy levels up. You might want to consider doing some voice exercises, this all helps to make sure that your live audience are greeted by someone who is going to capture and keep their attention! Co-presenting a Facebook Live show is an option. Facebook are currently rolling out a feature which allows you to co-present a live video when using the mobile Facebook app – if someone is watching your live video you can bring them forward to present with you. I experienced this first had a few weeks ago when I went live with Janet Murray after appearing on her podcast. It was super slick and saved getting your head around yet more online tools. Good job Facebook! Ian co-hosts a weekly Facebook Live show with Julia Bramble called The Free Range Social Show. Ian explained on the podcast how the plan for co-presenting can be very much similar to conducting a live broadcast on your own. However, a big benefit of having co-host is that you can bounce ideas off each other and it can flow very nicely. Ian recommends that you don’t have too much banter and small-talk…you want to cut out the chitter-chatter and keep it interesting for your guests. Having a structure to your show is even more important when you have co-presenters. When it comes to tools for live video, rule number 1 is do not overcomplicate things and keep it simple! You can start by going live on your smartphone using the Facebook app. You can enhance the experience by getting a lapel microphone which will improve sound quality (really important if you go on to repurpose your video, especially if you are repurposing your video into a podcast episode…I have a future podcast episode incoming on this topic). The only drawback with this approach is that should you want to use your video for other purposes, for example, uploading to YouTube, the quality of the video that Facebook provides you with is low quality. This is great software, it’s under $30. You record your live video from within eCamm, which you integrate with Facebook, so that it streams your recording to Facebook Live. You can save your video in full HD and it displays the comments. It’s really good but it’s only on desktop and only on Mac. Starts at $29 per month. You can do all sorts of great things with your live video, like create multiple cameras on ipads and iphone with your ios devices, add graphics and effects, multiple camera angles and more. Ian really recommends OBS studio. Whilst there is a bit more of a learning curve when using it compared to eCamm Live there is so much that you can do and it’s free. You record your video in OBS Studio, stream to Facebook Live, and you can then save the video in full HD (great for repurposing). Plus you can do lots of cool things like bring in guests, switch scenes, add webcams. If you’d like to use OBS and want some help, I highly recommend taking Ian’s online course - he will rapidly reduce the learning curve and you'll be recording live video with OBS in no time. Using a tool to get a really great quality video would really enhance your repurposing endeavours. 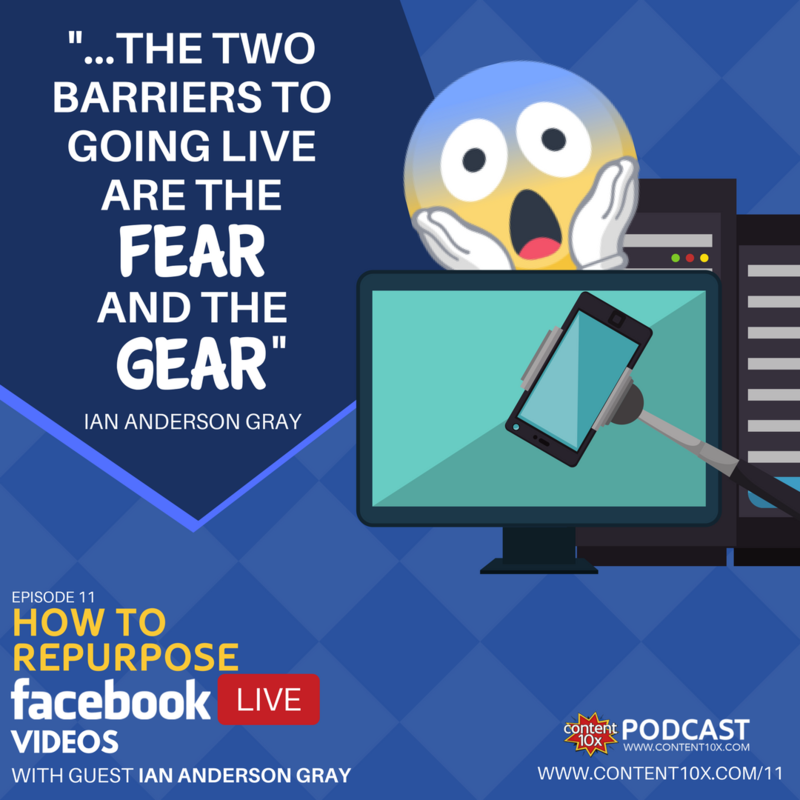 The two big barriers that most people face when considering going live on video are the fear - what if something goes wrong? The second big barrier is the gear – what gear and gadgets do I need to have? Keep it simple. Get started with your Smartphone. Go live just to yourself in your Facebook app (change the privacy setting to ‘only me’). Overcome the fear of getting in front of the camera. Ian shared a great idea - why not start a ‘live challenge’ with a few of your friends where you challenge each other to go live every day for 5, 10, 30 days! The frequency will help you to build the habit and the confidence. Getting involved in recording live videos is a really good thing to do. Live video is emerging and as such, if you get started with it you are an early adopter! Of course, things will go wrong…it’s live after-all! Accept the hiccups and bloopers and have some fun. You can even repurpose the bloopers into individual short videos! If you’d like to learn more about Ian and live video head to Ian’s website by clicking here, or find in on Twitter, Facebook and Instagram.